Clockaudio, a global leader in pro-AV microphone technologies based in the UK and with offices in North America and Asia, has officially launched their newest addition to the Clockaudio family, the CDT-100 MKII. 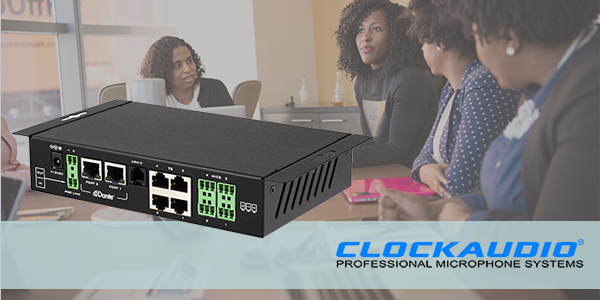 The CDT-100 family is built to streamline data and power cables for boardrooms, conference rooms and video rooms, reducing the cabling requirements from multiple and individual microphones from the conference table to the AV cabinet. Offering several more options than its CDT-100 predecessor, the ‘second generation’ CDT-100 MK II Dante device has been upgraded with an extra output pin – in preparation for the arrival of Clockaudio’s new RGB control devices. The extra output pin, located on the RJ45 ports, is positioned for lighting up the blue LED on the TS003. In addition, all three LED colors can individually be set from ‘off’, to ‘full brightness’ in 256 steps, offering the full range of the color spectrum. Learn more on the Clockaudio website.